If you're like so many of us who could use a little more time with nature, then get inspired by this space by designer Will Taylor of Bright Bazaar. Here, elements of the outdoors are brought inside for a sophisticated spin on a rustic style. Wood finishes are the defining feature of the room — from the white shiplap wall, to the overhead beams, to the wainscoting, to the bed frame — but the abundance of that material doesn't feel overwhelming. Why? Well, it's used in various shades and stains, most notably as black window frames, which helps create a cool textured effect despite such minimalism. As far as accessories go, an industrial table lamp further emphasizes that cool factor while a charcoal drawing provides movement. But it's clearly the bedding that steals the show, thanks to a verdant bedspread that complements the art overhead and the natural details throughout the space. 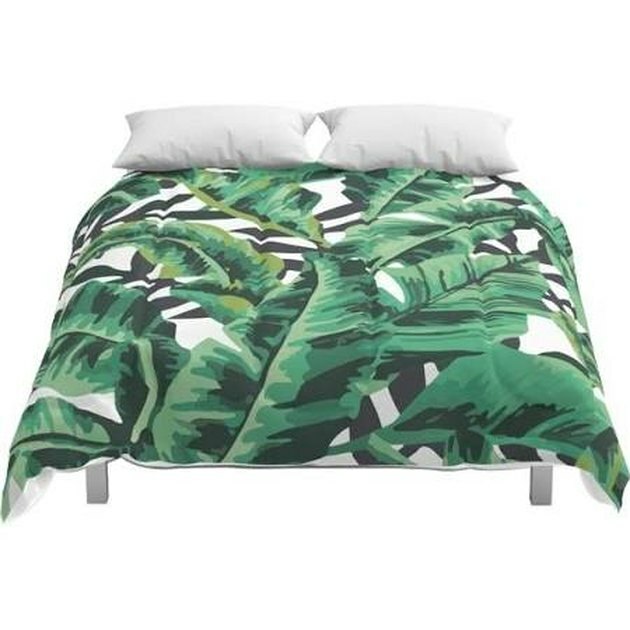 Bring some no-maintenance greenery into your life with this lively bedspread.